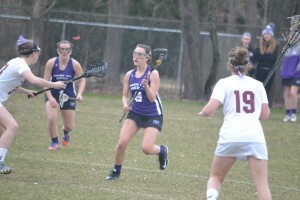 The first half of last Monday’s Cherry Hill West girls’ lacrosse’s 15–6 loss to Holy Cross felt like an eternity for Lady Lions’ senior Lindsey Coyle. 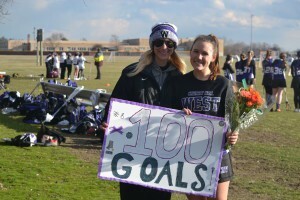 After pouring on seven goals in a 20–7 win against Williamstown on March 26, Coyle entered last Monday’s game just one goal away from scoring the 100th of her high school career. However, in the first half, every chance Coyle had to score No. 100 was thwarted. Four times, Holy Cross goalkeeper Cassy Skelton made a save on a Coyle shot, and numerous other times, multiple Holy Cross defenders would swarm her, preventing Coyle from getting a quality shot off. During a break late in the half, Cherry Hill West head coach Melissa Venturi gave Coyle some words of advice. Using her coach’s advice, Coyle would not be denied. In the opening minutes of the second half, Coyle sprinted around a pair of Holy Cross defenders and used the fake Venturi told her about to finally beat Skelton and score her 100th career goal. It was fitting how Venturi helped to settle Coyle down prior to the second half. The two share a special relationship going back a number of years. Prior to being hired as the head coach for Cherry Hill West girls’ lacrosse in 2014, Venturi coached Coyle with the South Jersey Devils club team. Having seen Coyle play for four years, Venturi knows every aspect of her game. Venturi and Coyle’s communication was key in helping Coyle reach her milestone last Monday. Coyle said the prospect of scoring her 100th goal was weighing on her early in the game. She credits Venturi with helping her settle down. Venturi was confident Coyle would come back stronger in the second half. She said Coyle listens to everything her coaches tell her and really takes it to heart. When she watches Coyle play, Venturi sees a player who is full of sheer determination. She feels Coyle has embraced her role of leading the Lady Lions by example. Next year, Coyle will attend Division II Bloomsburg University in Pennsylvania, where she will continue her lacrosse career. She felt Bloomsburg was the perfect fit, both for academics and lacrosse. Coyle plans to continue scoring and contributing to her team in hopes of leading Cherry Hill West on a playoff run. In the meantime, Coyle and Venturi plan to cherish every game they have left together as player and coach.